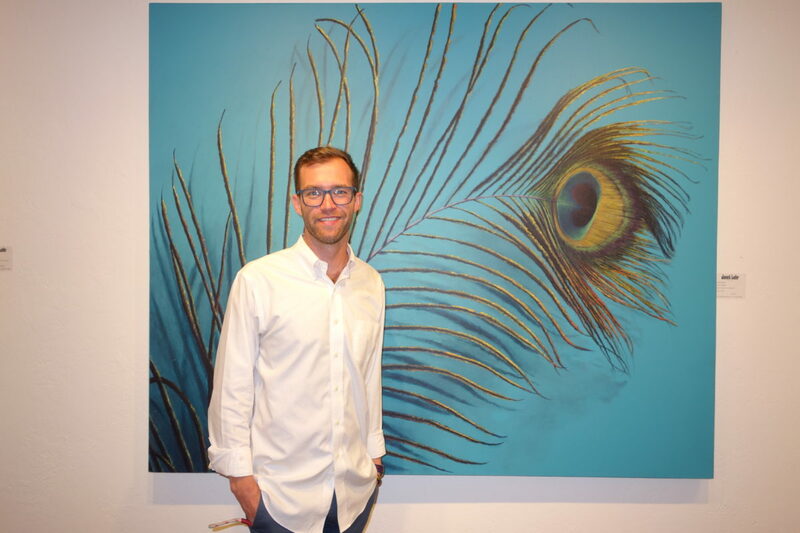 Artist, Adam Umbach, spoke at Janet Lehr Fine Arts in East Hampton. July 22, 2018: On Sunday against the backdrop of “Janet Lehr’s Big Contemporary Show – Art on the Edge 2018,” now on display at Janet Lehr Fine Arts, 68 Park Place in East Hampton in the passage way across from the cinema, Adam Umbach, an artist in the exhibition spoke at noon. 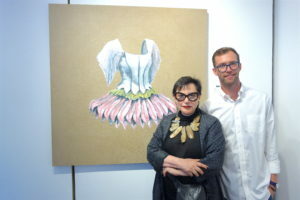 Janet Lehr, Adam Umbach in front of Ballet Dress. Oil and enamel on canvas, 2018. 48 x 48 inches. Adam Umbach says : I looked at Gerhard Richter and ‘saw the light’ Adam Umbach grew up in the shadow of the Art Institute of Chicago, one of the first U.S. museums with a significant collection of the works of Gerhard Richter. Richter, whose work has topped $50 million at auction, is an acknowledged master of the art of painting today. It is Richter’s uncompromising realization that art is a language. Since language conveys meaning, he deconstructs painting into its constituent brushmarks, playing with the data and conventions that enable pictures to mirror the real world. In other series he explores the make-up of color and the myriad hues possible within the spectrum. One reason that Richter is so important is that he has kept painting alive – in a very ingenious manner too. He is known for his diverse painting styles and subjects which span the very painterly intermixing of color in his ‘pulled’ paintings, to works exploring the geometrics of Modernism. I do like to believe that my work is all about light.